Hell’s Gate. Gothamist reports that the NYC Economic Development Corporation is planning to spruce up a trail beneath the Hell’s Gate Bridge railroad trestle on Randall’s Island. 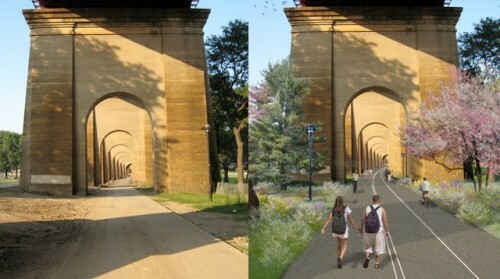 The pedestrian and bike path will eventually connect to the South Bronx Greenway. Portlandia Greenway. A multi-use path planned since 2004 is finally getting underway in Portland, according to Bike Portland. The South Waterfront Greenway Trail might not feature those great archways from the Hell’s Gate Bridge, but it does offer another innovation: separated pedestrian and bike paths. Biking JFK. Golden Gate Park could be much more bikable this spring. StreetsBlog says a bright green dedicated, bi-directional bike lane is planned along San Francisco’s John F. Kennedy Drive and will eventually connect western neighborhoods with downtown and park attractions. Have you’re say. The Brooklyn Greenway Initiative and the Regional Plan Association are hosting a visioning workshop for a planned greenway in Red Hook, Brooklyn. You can voice your suggestions for the Columbia Street Waterfront Park tomorrow, February 2 at 6:30PM.